Observe carefully in photographs No. 2 to 8 the quite perfect straight line of the position of the dumbbell in the course of the action. 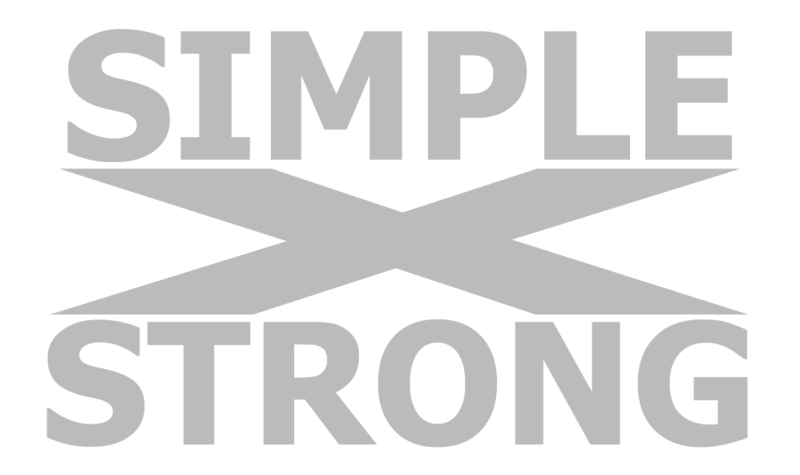 It moves neither up or down, an example of technique that is very perfect. 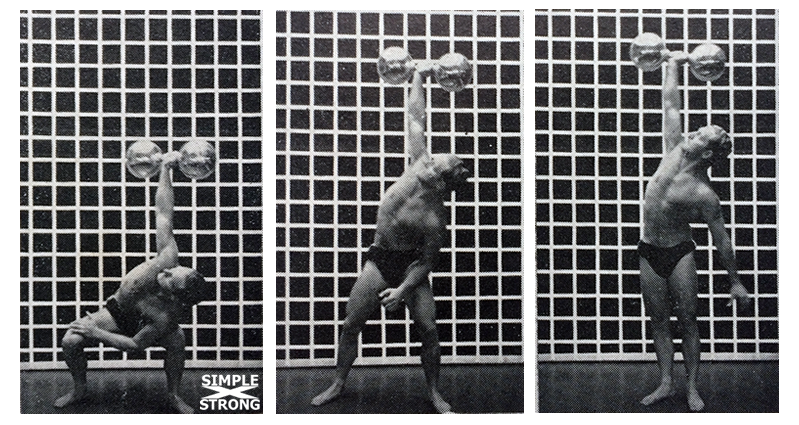 The beautiful weight used in these photos is the author’s very spectacular silver dumbbell, given him by the famous G. W. Rolandow. It weighs 137 pounds. Its beauty [is] lending tone to exhibition work. 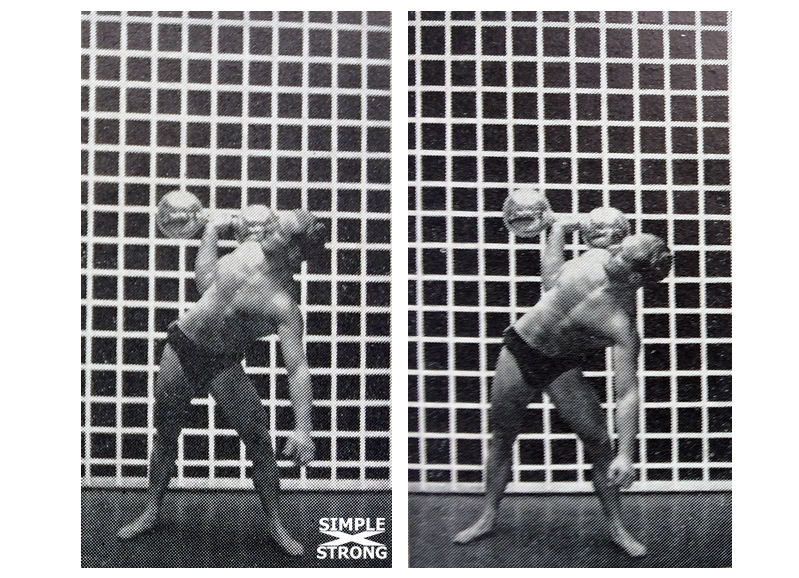 Louis Garbarini demonstrates bent press form. The charted background was not painted in, but was built with six-inch squares and the lift photographed in front of it. 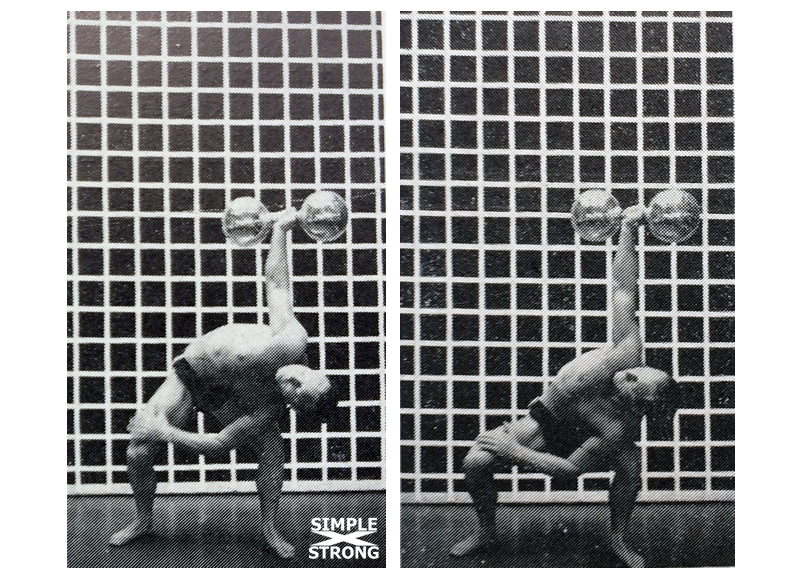 It shows that the weight remains at the same level, the body bending down under it until the end. Read the text description and then study these pictures. No. 1 showed picking up the bell, and No. 2 pushing it back in position, elbow on hip. No. 3. and No. 4. show start of the bend; left knee starts bending. In No. 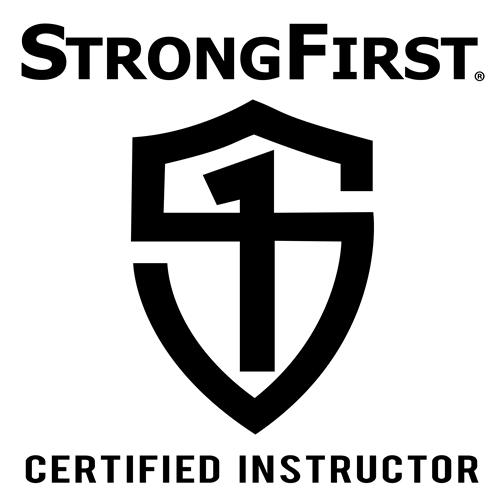 5. the left arm slides down inside left knee, and the right knee is bending, with the arm three-quarters straight. In No. 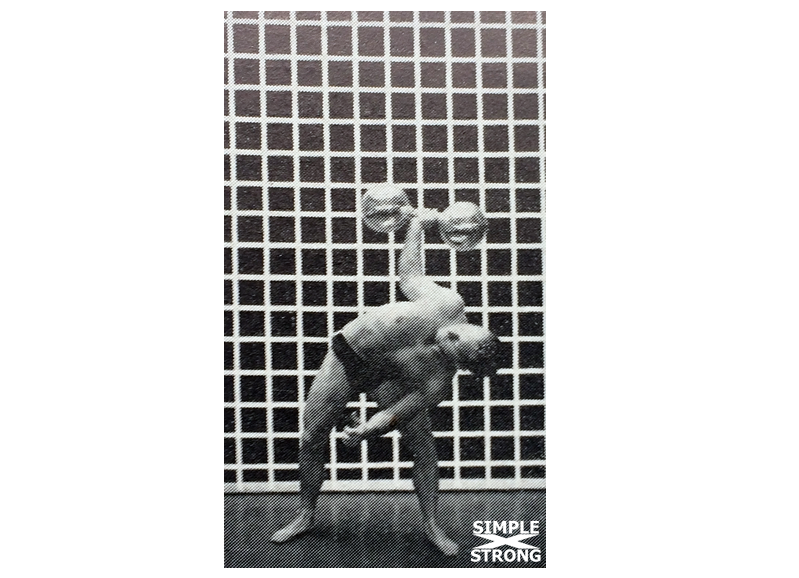 6 and 7 the bend increases, the lifter squats deeper, the left shoulder goes down inside the left knee, the left arm reaches across for support on the right thigh, and also the right arm straightens under the weight. In No. 8 he is starting to go up; in No 9. he stands up and in No 10 he brings his feet together. 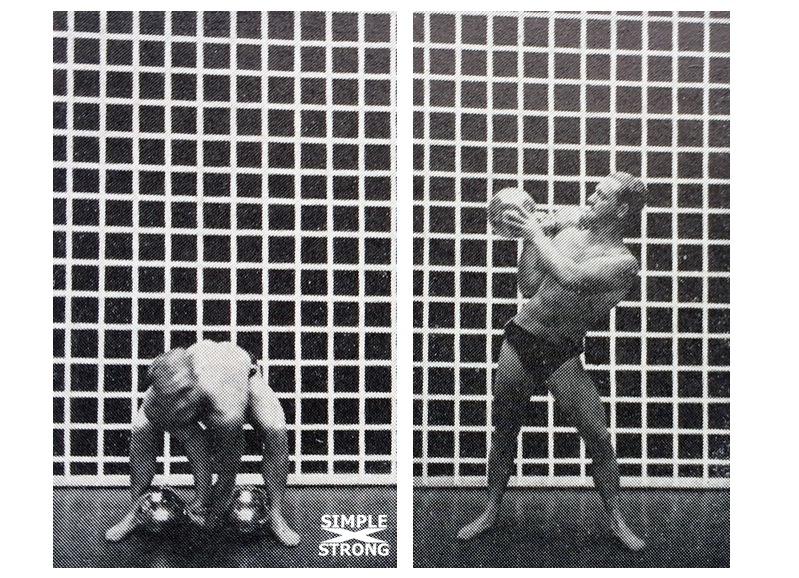 The squares show the position and the sideways movement of the weight. In No. 2 the hand is in the seventh square form the right; in No. 4 in the sixth; in No. 6 and No 7 in the fourth, with arm and weight in a perfect line above the left foot. Please note this line very carefully. 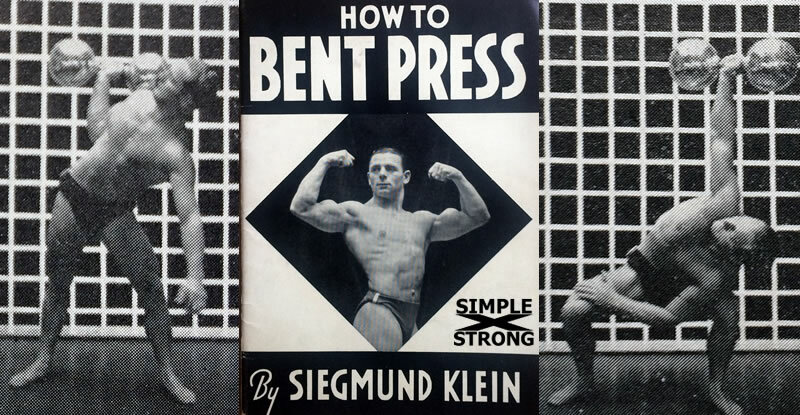 Siegmund Klein, How to Bent Press, 1938.